Are you looking for the perfect party dip? 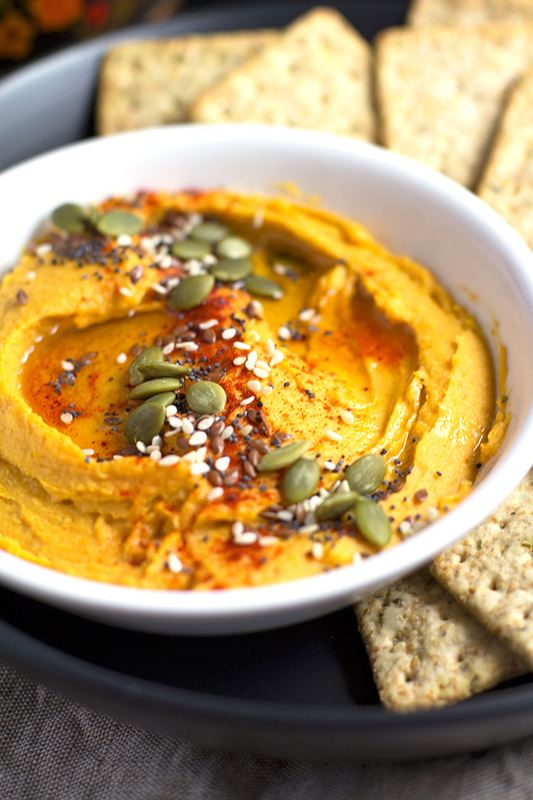 Then look no further, cause this Sweet Potato Hummus is just what you have been searching for. I love this time of the year down here in Auckland, New Zealand. The sun is shining on a daily basis. People are walking around happy and motivated. Bodies smother beaches up and down the coast, soaking up the suns rays. And everybody is attending parties on a daily occurrence. And whats a party without a dip? Not much of a party at all, I say. 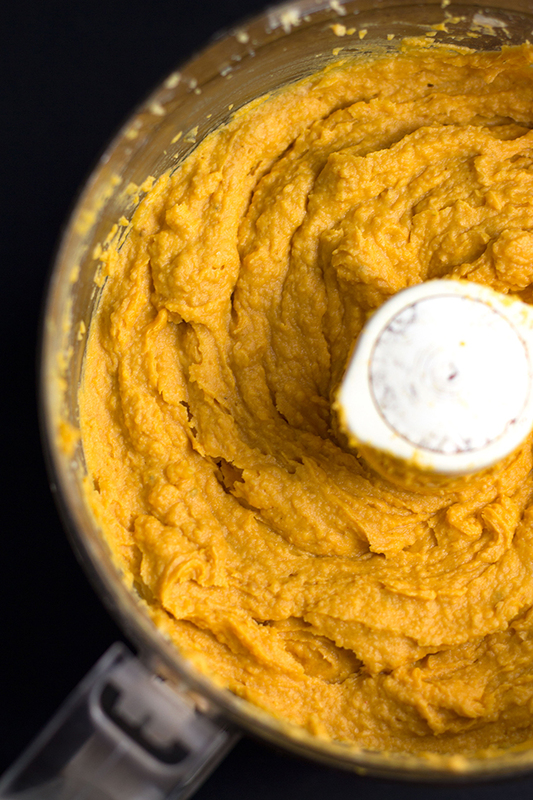 So grab your food processors friends, as I show you the best Sweet Potato Hummus ever to share at your next party. 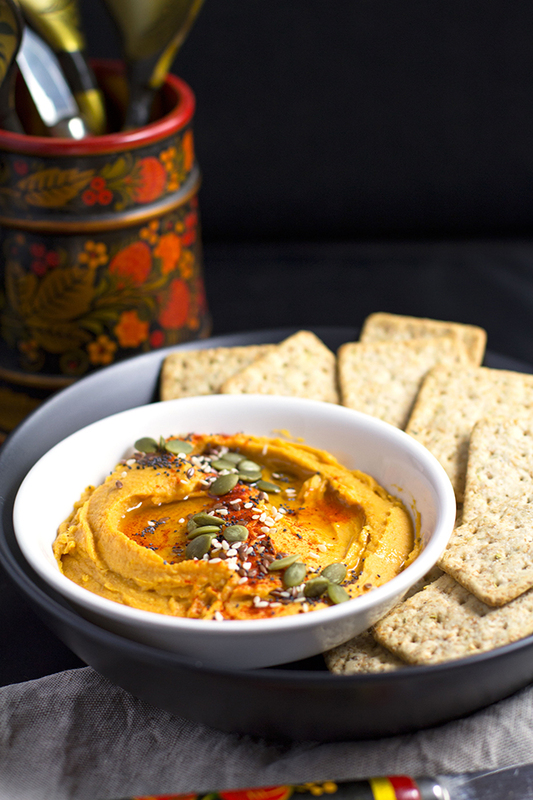 To create this delicious hummus you will need to roast the sweet potato chunks in the oven first until they are soft and tender. These gorgeous chunks of sweet potato give this hummus an incredible thickness and a spectacular flavour. Once the sweet potato chunks have cooled down it is time to get blitzing. Add a can of drained chick peas, cause lets face it, it ain’t hummus without chick peas, right? Next a good squeeze of lemon juice for freshness and tang. Then a good amount of tahini. I used six tablespoon worth in this recipe cause I love the sesame goodness that tahini brings. But if you’re not a huge fan, then you can cut it down to four tablespoons without losing the flavour it brings. A sprinkle of my secret ingredient, ground smoked paprika. This stuff gives the hummus a next level smoky flavour that you guys are going to absolutely love. And finally a few cloves of garlic, salt and a good slug of olive oil and you are on your way to experiencing the best hummus you have ever tasted. Now like I mentioned this is a party sized hummus, like we are talking about filling a 40.5 ounces/1.2 litre containers worth. So if you have a smaller sized food processor you may want to blitz this up in two lots and then mix them together. To serve I sprinkled a seedy topping of pumpkin seeds, poppy seeds, flaxseeds and sesame seeds for a bit of crunch. And an extra sprinkle of ground paprika and olive oil. 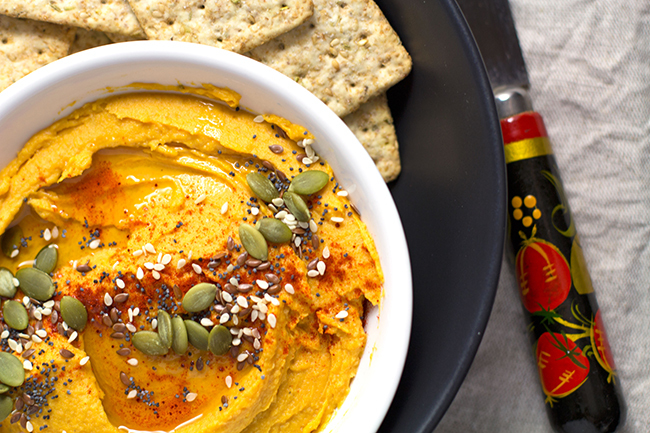 This Sweet Potato Hummus is guaranteed to satisfy anyone you share it with. It is 100% gluten, dairy and nut free. And will get the thumbs up from both your vegetarian and vegan friends. 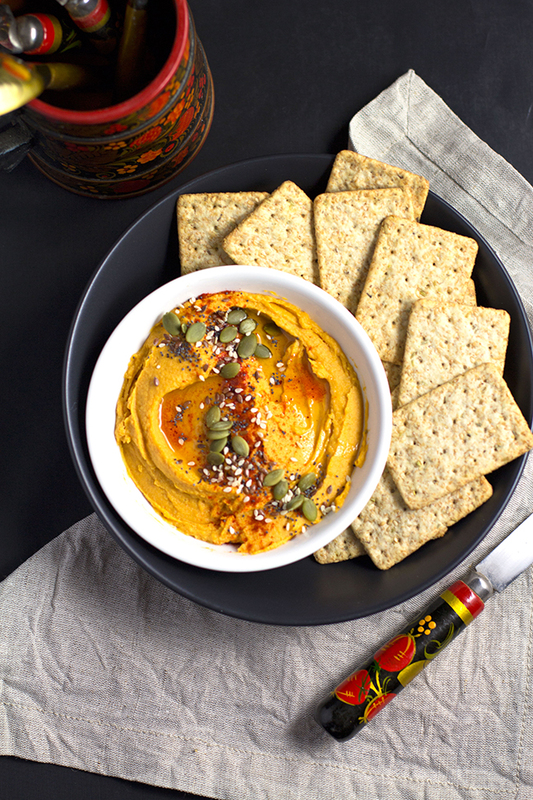 And if you think that you would totally love to try this Sweet Potato Hummus but don’t have a party to attend to. Then don’t worry just half the recipe and you will be smiling. It should last for a few days when kept in an airtight container in the fridge. 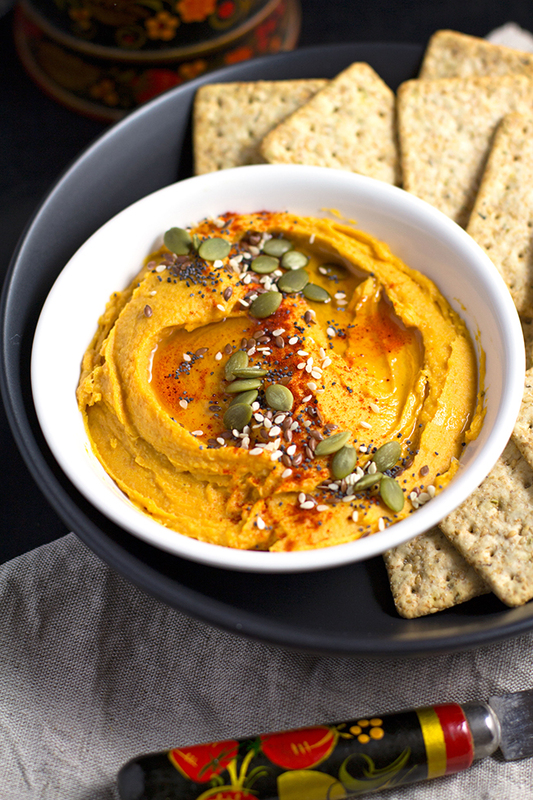 I love hearing about your cooking adventures guys, so if you try this Sweet Potato Hummus recipe out then don’t forget to tell me about it. Just leave a comment down below. Preheat oven to 430 (220C). Place sweet potato chunks, olive oil, salt and pepper onto baking tray and give a good toss. Roast for 25-30 minutes or until tender, stirring halfway through. Set aside to cool down. Place all ingredients (except for extras and topping) into food processor and blitz until smooth. You may have to scrape down the sides a few times to ensure that it all mixes together. Serve with extra olive oil, paprika and seedy topping. This sounds amazing. I cannot wait to give it a try. Sweet Potatoes are coming back in season here in the states so now would be the perfect time. Could it be used with pita as well?